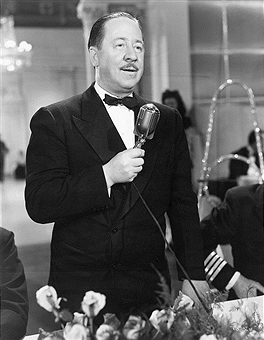 While at Philips Exeter, where preppies studied Milton and Shakespeare, Benchley wrote his senior thesis on “How to Embalm a Corpse.” Thus began a lifelong penchant for laughing at death. But death would not have the last laugh. At Harvard, Benchley’s impromptu after dinner speeches amused fellow frat boys with pseudo-serious nonsense, ala Monty Python’s John Cleese. One night he might be a government official telling Harvard “what we are doing down there in Washington!” Another saw him a returning explorer ad-libbing “Through the Ailmentary Canal with Gun and Camera.” When he graduated, with World War I underway, he was urged to grow up. He refused. 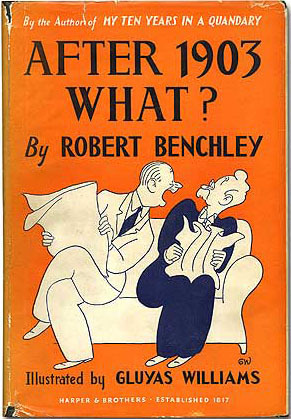 As Americans struggled through the Depression, Benchley’s taught them “How to Watch Football,” “How to Sleep,” “How to Sub-let…” Hollywood used his faux expertise by casting him in dozens of films. He took fame in stride, continuing to make the world his straight man.